A worthy champion emerges at BlizzCon. In June 2016, Heroes of the Storm’s pro scene had a major upheaval. Cloud9, the winners of the World Championship at BlizzCon in 2015, disbanded. On top of being disappointing for many fans, it presented a question for the rest of the year: who would take their place as the world champions without anyone currently on the throne? With no team to defend their title, the Heroes of the Storm Fall Global Championship was open for anyone to take—both major teams, backed by fan bases and a couple years of experience, and the smaller teams, especially those from less-competitive regions. At BlizzCon this weekend, that question was finally answered and a new champion crowned. We covered the preliminary group stages last week, and BlizzCon began by finishing what those group stages started. On day one of BlizzCon, four more teams got eliminated. In group A, Team Dignitas proved their worth over Astral Authority and quickly followed that up by defeating Please Buff Arthas to secure a semifinal place against Ballistix. Neither game was a struggle for the European team, winning both in decisive fashion to go 2-0 in the best of three. In group B, though, the real magic happened. ZeroPanda knocked Denial eSports out of the tournament with ease—ZeroPanda’s control shown in how easily they utilised Dehaka to secure a kill against a fleeing Muradin. Then, they took on Fnatic in a decider match. This was the start of Fnatic’s chaotic and absurd series of events at BlizzCon 2016. The series first fell in ZeroPanda’s favour, was snatched back by Fnatic, and went back to a third game, on Cursed Hollow. Fnatic took a specific team composition, the core of which revolved around Stitches, a warrior whose key ability allows him to hook an enemy from far away to drag them in, but Fnatic didn’t stop there. One of the possible Heroic abilities for Stitches is Gorge—he eats an enemy hero, storing them in his stomach for a few seconds, letting him run away before spitting them out into his allies. The aim was simple. Hook in enemies, eat them up, and spit them out onto a barrage of damage. While this plan didn’t quite go to plan, ZeroPanda weren’t able to take advantage of the weaknesses of this composition and couldn’t quite take a lead for themselves. With attempt after attempt to do this against the enemy Muradin, plus a couple of brilliant dodges from Brightwing, the game ended in a desperate attempt from ZeroPanda to rush Fnatic’s core. You can see below how well that went. This one core attack lost the game for ZeroPanda, knocked them out of the competition and allowed Fnatic to move on to the semifinals, where they would face tournament favourites MVP Black. This meant both semifinal games came down to European versus South Korean matchups—and considering the South Korean dominance in every other competition at BlizzCon, it didn’t look good for the European representatives. That’s why it was huge when Fnatic managed to win their first game against MVP Black after a chaotic last-ditch attempt from the favourites to finish the match. Check out Tom's interview from BlizzCon to find out more about Heroes of the Storm's fiery new hero. Until they faced Fnatic, MVP Black had not lost a game at BlizzCon 2016. Being tournament favourites, a 3-0 sweep was expected in this best of five, but Fnatic pulled a win, using a European specialty: Leoric. In most regions, Leoric’s not a chosen hero, but in Europe, he’s popular, and Fnatic brought it out to show MVP Black what he can do. It was even more surprising, then, when Fnatic won game two. 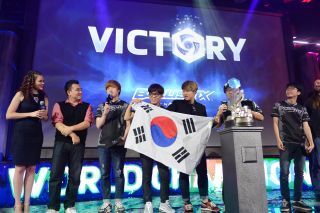 They beat MVP Black at their own game, even, using a composition of mobile heroes to outmanoeuvre their opponent to another dominant victory. In game three, the South Koreans fought back, taking a game with phenomenal Medivh play (with Jae Won “Rich” Lee proving to be a fantastic player on him) but in game 4, Fnatic shut that down by flipping things over and taking Medivh for themselves, putting the first spot in the final in Fnatic’s hands. On the other side of the bracket, we had the reverse story. Ballistix took out their European competitors in both game one and two almost casually. Jeongha avoided death in game two by just slipping out of the way of three abilities, like it was nothing, with his team following up as the cleanup crew. In game three, Ballistix tried out a composition based around Illidan—a hero South Koreans are known for playing extraordinarily well—but were shut down by Team Dignitas, although that just postponed the inevitable, and Team Dignitas were knocked out by Ballistix in game four, ending the series 3-1. Fnatic and Ballistix would then go head-to-head to decide the championship. In game one, while Ballistix really showed off that same skill which caused them to dominate against Team Dignitas, Fnatic followed suit. Using Tyrael’s heroic ability Sanctification, though, Ballistix were always one step ahead of the Europeans, and took the game. 1-0 to Ballistix. To combat that, Fnatic took Tyrael in game two, trying to do something similar. Unfortunately, Ballistix know both how to play with a Tyrael and against one, and, again, bested Fnatic, albeit this time, the game was far, far closer. 2-0. On Warframe Junction, Fnatic had to fight back. In perhaps the most intense game of the tournament, the teams traded nukes back and forth, the game’s crucial moment coming down to a chaotic fight over the boss, featuring three nukes, eight deaths, and two screaming casters. Despite losing out on the fight, Fnatic rolled with the momentum of taking that boss to take game three, and stay in the series. 2-1 to Ballistix. In game four, Fnatic went back to the same tactic from their set against ZeroPanda the day before: a Stitches composition, trying to pull the same miracle out of the bag, but it wasn’t to be. Unlike ZeroPanda, Ballistix knew exactly what to do against Fnatic's strategy. Ballistix utterly destroyed Fnatic in game four, proving themselves worthy of the title of Heroes of the Storm Global Champions. Losing only two games in the tournament—one to each European team—and controlling in all others, Ballistix truly deserved their victory, and the right to raise the cup.